Prior to the formation of the Palmerston North Orchestral Society in 1894, there had existed a Philharmonic society “for the performance of glees and instrumental works” and achamber music group. These groups formed the nucleus of the Orchestral Society, which presented two concerts each year in the Theatre Royal (erected c. 1875) and performed in the Opera House for its opening gala in July 1905. After this concerts were given at the Opera House. Copies of programmes are held in the City Archives. The Orchestral Society went into recess during World War II and was not revived in the immediate post-war years. Eventually in 1960 Len Schwabe, Head of Music at Freyberg High School, initiated the rebuilding of a symphony orchestra. The initial stage of this project consisted of the formation of a Youth Orchestra. In October 1961 thirty-three foundation members of what was initially called the Palmerston North Youth Orchestra presented an informal concert at Freyberg High School. Many talented musicians who had their start in the Youth Orchestra have taken up professional positions in leading New Zealand and overseas orchestras. By 1966 progress on the Youth Orchestra had reached the point where formation of a more advanced orchestra was possible. Named the Manawatu Sinfonia, it began with thirty players, made up of graduates of the Youth Orchestra and other senior players from the city and surrounding districts. The first Sinfonia concert was given in April 1967. The first combined concert featuring both Sinfonia and Youth Orchestra was presented in the Opera House in October 1967. It has since become an annual fixture, with the two groups presenting their separate programmes before combining for the final items. In the earlier years the society presented only two concerts each year but since 1987 this has increased to five concerts (normally three by the Sinfonia, one by the Youth Orchestra, and one by the two orchestras combined). Guest conductors, both local and national, have long been a feature of Sinfonia presentations. In 2001 the Sinfonia created an opportunity for local aspiring conductors to test their skills by directing the orchestra in several programmes. It has also been the policy of the society to give orchestral members the opportunity to present solo concertos. Additionally, soloists of national standing have accepted invitations to be guest artists with the Sinfonia. These include Alex Lindsay (violin), Anthea Moller (soprano), Barry Mora (baritone), Elsa Jensen (violin), Colleen Rae-Gerrard (piano), Rae de Lisle (piano), Brenton Veitch (cello), Eugene Albulesco (piano), Margaret Medlyn (soprano), David Cox (horn), Hiroshi Ikematsu (doublebass), Martin Riseley (violin), and Bruce Greenfield (piano). Local choirs have combined with the Sinfonia to present several major choral works including Handel’s Messiah, Haydn’s Creation, Mendelssohn’s Elijah, Brahms’s German Requiem and Bach’s Mass in B minor and Magnificat. 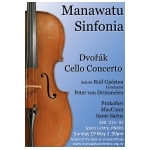 In 2011 the Manawatu Youth Orchestra Inc. celebrated fifty years of music making in the Manawatu. Written for the occasion by well-known local historian Dorothy Pilkington was the Jubilee Book “Playing On: A history of the Manawatu Youth Orchestra and Manawatu Sinfonia 1987-2011”.